When you’re at work, your dog can be playing and getting the attention he needs (instead of chewing on the living room furniture!). 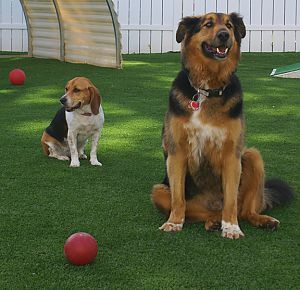 Dogs who come for day care have opportunities to play throughout the day in groups or individually. Agility ramp—it’s not always work! We recognize that not all dogs require the same amount of stimulation during the day, and we know that some dogs need a lot more. We offer many Extra Special Extras to make your dog’s day even more enjoyable. All of our visitors are tested for temperament and social skills before they are grouped with any other animals, and we keep a very careful eye on all of the animals to ensure your pet’s safety and comfort while he stays with us. Your pup can enjoy the amenities provided at our facility including our new Water Park! Dogs are separated based on their temperament and social skills to ensure the safety and comfort of your pup. Learn about more of our Extra Special Extras available to your doggie during the day. Ask about our Gold, Silver and Bronze packages! Request a reservation online or give us a call with any questions you have about our services or facility, or to set up a time to come see us. We’d love to meet you and your furry loved ones!